Hello. My name is Woo-Jae Kim, I am a laboratory SPEL freshman. I went to lottecinema in Suwon to watching a movie with laboratory SPEL peoples to celebrate the end of the year for the first time. We watched ‘Rogue One : A Star Wars Story’. It started with dominating galaxy by darkness. Imperials kidnap a scientist, Galen Erso(Mads Mikkelsen) to plan excessive weapon develop project. And it is called Death Star. It is armed space station and have the power that can destroy a planet perfectly. So, Rebels give a mission that steal Death Star`s weakness to Jyn Erso(Felicity Jones), Galen Erso(Mads Mikkelsen)`s daughter, because he joined the project. Before Death Star which can destroy a planet is completed, Success rate of the mission that Rebels should steal blueprint is only 2.4%. Under mission, Jyn Erso(Felicity Jones) meet and go with many people. 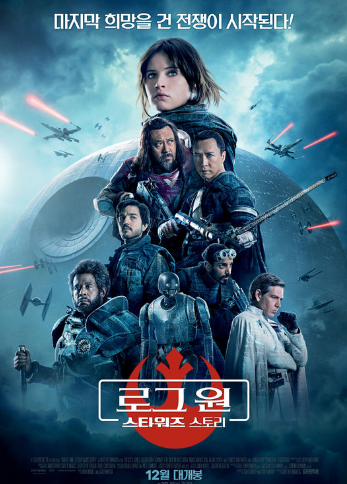 Kashian andoreu(Diego Luna) who received mission that is killing Galen Erso(Mads Mikkelsen), Chiruteu Imwe(Donnie Yen Ji_Dan) who is blind, but has high-level martial arts skills, Bayes malbeousue (Jiang Wen) who battle machine, body luk(Riz Ahmed) who is a cargo ship`s pilot and finally droid K. this group name is Rogue One. Rogue One continue resisting to imperia in mysterious circumstances without give up. In result, rebels success to send Death Star`s weakness file to rebels space station. So, Darth Vader is so angry and uses a lightsaber to steal the weakness file. I think that everyone who like Star Wars Series make shudder. It show why Darth Vader is called lord of fright. Anyway Darth Vader failed to steal the file and rebels spend the file to Princess Leia(Carrie Frances Fisher). And Rogue One story is end. It made best scene for 5 minutes with Darth Vader, and I remind Rogue One`s mean again that is a bridgehead being new hope through ‘hope’. After that, you can see the story throughout Star Wars4-New hope. Personally, I wathched movie very exciting and interesting because I am a Star Wars big fan. So, I think if you haven`t never watch Star Wars Series, you may feel boring and is not easy to understand story. So, I recommend that you should see Star Wars Series or know total story before watching Rogue One. Finally, I am grateful to Professor for making time to eat dinner with laboratory SPEL people and talk each other.